For many SIS professors and students, the summer months are just as productive as the academic year. Research, practica, and internships took many of them around the US and the world to interview local people, collect and analyze data, participate in social movements, and learn new skills. 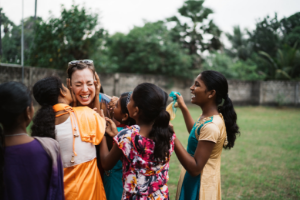 Julie Walton, a graduate student in the Social Enterprise program, would be the first to tell you she never planned to go to graduate school – but after five trips to Sri Lankan orphanages, she felt compelled to do more. She kept hearing from boots-on-the-ground organizations and officials that there was only so much they could do without broader institutionalized reform, so she decided to pursue lasting change via policy. These rights include items like nutrition and education as well as rights people in the West may not consider, like the right to be protected from exploitation and access to toilets. By scoring these rights across different countries and cultures, the hope is that the core elements – the essential needs of children – will reveal themselves, and research like Walton’s will provide valuable insight into how we can best care for kids in need all around the globe. Why, in an area with an abundance of productive land, are residents malnourished, obese, and food insecure? One SIS undergraduate student returned to her grandmother’s home in rural Appalachia last summer to dig deeper into what goes wrong for residents looking to access healthy food. More time commuting means less time at home to tend a garden or work the family farm – plus decreased job opportunity and lower wages mean that proportionally, there is more upfront cost to plant. Why bother when a box of shelf-stable food is immediately available for two dollars nearby? Despite the region’s high soil quality and available land, most of the area is monopolized for high commodity cash crops like corn and tobacco, produced and exported for out-of-state consumption. She hopes her research will be used as a microcosm for the study of food security in other rural areas. A recipient of the Dean’s Summer Research Award, Professor Robert Kelley spent his summer researching the life and legacy of Samantha Smith, a Maine schoolgirl who rose to near-overnight fame after exchanging letters with then-Soviet leader Yuri Andropov. In 1983, Samantha’s correspondence led to an invitation to visit the USSR, and the powerful impression she made became an unexpected cultural diplomacy coup. Later, her sudden death in a 1985 plane crash sent shockwaves around the world, with both Americans and Soviets mourning her loss. His goal is to better understand the human impact of one citizen’s cultural diplomacy. Recent SIS graduate Abrar Rageh spent her summer in Doha, Qatar, interviewing Egyptian activists who were active in the 2010-2011 Arab uprisings commonly known as the Arab Spring. While at AU, Abrar developed a resilience-building framework based on her research with communities of color in the US and Puerto Rico. A student from the Ethics, Peace, and Global Affairs program, she was particularly interested in researching how communities build resilience after collective trauma and disrupt the negative feedback loop that further demoralizes the disenfranchised. Rageh discovered that Egyptian revolution participants, many of whom witnessed or experienced tragedy first-hand, are increasingly demoralized. The same individuals who once fought for and encouraged a sense of pride in their Egyptian identity are now facing a unique set of challenges that include isolation and the ongoing physical threat against themselves and loved ones remaining inside Egypt. Rageh argues that resilience is both key to catalyzing a revolution and a tacit form of resistance in the face of repression. Her research builds a framework hoping to encourage and revitalize the community by providing resiliency-building techniques and workshops, and despite the challenges, she remains inspired by the belief that when people take control of their agency, they can reclaim their freedoms. Veronica Ferris spent the summer in Washington, DC, taking summer classes at American University and volunteering at Iona Senior Services under her Returned Peace Corps Volunteer Coverdell Fellowship. For her course on fundraising and grant-writing, she developed a mock grant proposal using the example of a real solar energy project she previously worked on while volunteering with the Peace Corps in Namibia. Ferris, a graduate student in the International Development program, also enjoyed her monitoring and evaluation course and looks forward to putting her skills to use as she conducts needs evaluations and plans projects in the developing world. As a volunteer at Iona Senior Services, Ferris participated in the Capital Pride Festival, encouraging LGBTQ+ people to have pride at any age, and promoted local services for older adults in the area. She created a database of older adults in need of volunteer assistance, and coordinated volunteer matches while working hand-in-hand with social workers. She plans to continue volunteering with Iona Senior Services throughout the fall semester, and is looking forward to learning even more about coordinating volunteers — a skill that will be invaluable in her future work in international nonprofits.